A new, extremely cool collab from Chef Juno Kim and 33 Acres Brewing Co. is underway. And if under-the-radar, independent dinners are up your alley, you’ll be especially keen on heading to Mount Pleasant for a pop-up meal this Monday night. Every week, Chef Juno of Juno Kim Catering, will cook up a new three-item menu consisting of a snack, a meat dish and a vegetable dish. And they are beautiful. Juno is not only a skilled chef, he’s also an incredibly talented food stylist, so expect his rustic fine dining dishes to visually blow you away. 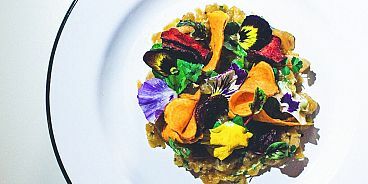 One of his recent vegetarian entrees consisted of charred heirloom carrots and leeks, kale, black garlic puree, Nelson the Seagull bread soil and sheep’s sorrel. No reservations are needed for Juno’s dinners at 33 Acres, but get there early before he sells out. With dishes going for anywhere between $8 to $15, I’d say this meal ticket is the best deal in town.